Faster and more powerful than ever before, Canvas X Pro 16 is specially designed to make it possible for engineers, small business owners, and technical graphics professionals to illustrate and communicate with confidence. Now with 64-bit technology, Canvas X Pro 16 has been fine-tuned for performance. Catering to a wide range of professionals — from graphics designers to engineers — this upgraded technology allows for more memory, faster performance, and is DPI-aware to take advantage of today’s most advanced hardware. The result is drastically increased document speed and the best graphics display available on the market. Canvas X Pro 16 also includes a new modernized interface for an enriched user experience. 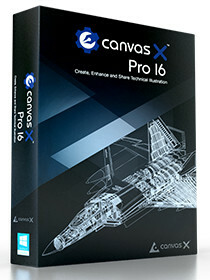 Canvas X Pro 16’s unique and integrated design environment makes it possible for users to work with and combine all graphical elements, and to apply high-end effects in a single document. Technical illustrators can now open and manipulate documents with over one million objects in seconds vs. minutes. Why try the new Canvas X Pro 16 ? Now available in 64-bit, Canvas X Pro 16 is our most powerful product to date. The upgraded technology allows for more memory, faster performance, and is DPI-aware to take advantage of today’s most advanced hardware. Tuned for improved performance. Caters to a wide range of professionals, allowing them to analyze, enhance, and share illustrations with ease and precision. Technical illustrators can now open and manipulate documents with over one million objects in seconds vs. minutes. Unique and integrated design environment makes it possible for users to work with and combine all graphical elements and apply high-end effects in a single document. New modernized interface for an enriched user experience. Now optimized to support 64-bit operating systems natively, Canvas X Pro 16 is quick, agile, and capable of working with documents with over 1 million objects. With the speed of Canvas X’s most commonly-used operations amped up, you will fly through your projects quicker and more efficiently. UI improvements allow for smoother, cleaner object editing. And with support for DPI settings for high resolution monitors, your projects will look crisp and clear, even on the big screen. With improved CGM import and export font size conversion and arcs, and support for the latest AutoCAD DWG/DXF 2013 files, Canvas X Pro 16 is truly provisioned for engineers and technical illustrators.